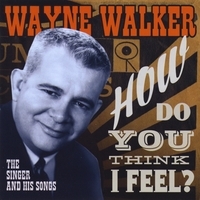 Wayne Walker – How Do You Think I Feel? All I Can Do Is Cry / It’s My Way / A Teenage Love Affair / Whatever You Desire / Just A-Walkin’ Around / Bo-Bo Ska Diddle Daddle / Come Away From His Arms / I’m Finally Free / It’s Written In The Stars / After The Boy Gets The Girl / Just Before Dawn / You’ve Got Me Where I Wanna Be / What Kind Of God Do You Think You Are? / Little Ole You / Now Is The Time For Love / You Got The Best Of Me / Lips That Kiss So Sweetly / Love Me / Can You Find It In Your Heart? / Outlaw / What ‘Cha Doin’ To Me? / Sweet Love On My Mind / The New Raunchy / Rosalie / How Do You Think I Feel? / Love Is Hard To Understand / Holiday For Love / I’ve Got A New Heartache / Sweet Love On My Mind / Rock The Bop / All I Can Do Is Cry / How Do You Think I Feel? / Are You Sincere? Wayne Walker wrote two songs that would be enough to engrave his name in the Rockabilly history: All I Can Do Is Cry and Sweet Love On My Mind. But it would be a mistake to reduce his body of work to this sole two songs. This more than deserved reissue gathers the sides he recorded under his name like the pure rockabilly classics like All I can Do Is Cry and Boo Boo Ska Didlle Daddle, rockers in a Cochran vein like You’ve Got Me and little Ole You (let’s not forget he also wrote Cut Across Shorty for Cochran), country with What Kind Of God Do You Think You Are, Hillbilly with Now Is The Time For Love or You Got The Best Of Me and tunes more in a teen idol style like It’s My Way, Whatever You Desire and A Teenage Love Affair (close in style to Burnette’s My Love You’re A Stranger for example). Also present are the duets with Jimmy lee fautherre (the excellent Love me and the no less superb hillbilly Lips That Kiss So Sweetly), and the songs he wrote for or were recorded by others including the epitome of the honky tonk song Ray Price’s I’ve Got A New Heartache, How Do You Think I Feel? (Elvis Presley and Red Sovine), and of course Sweet Love On My Mind (Johnny Burnette and Jimmy and Johnny). A rich 33 track compilation album that comes with a 12 page booklet full of infos. Share the post "Wayne Walker – How Do You Think I Feel?"